It’s nearly December, so all the apples are in and off the trees now. That leaves an annual problem…dealing with gluts. Luckily, I don’t have any gluts to deal with, but I do have friends who need to deal with theirs, leading to a slight over-abundance of Bramley apples. Apple pie? Too predictable. Baked apples? Nobody likes baked apples, really, do they? How about baking a few into some bread? This recipe calls for two different types of apple – a tart Bramley, stewed down so that it disappears into the dough, and a sweeter Braeburn, cut into chunks to give the bread some apple bite. The Braeburns, three of, need peeling, coring and cutting up into one centimetre dice before being fried in a good knob of butter until they start to brown and caramelise. The Bramleys, a pair of, should be similarly peeled, cored and sliced into thin strips, then simmered in about 100ml of water until they start to dissolve into a rich purée. Weigh out 450g of wholemeal flour and 225g of strong white flour, and add a couple of teaspoons of salt, a 7g sachet of dried instant yeast and 50g of caster sugar to the bowl. Melt 85g of butter and add this to the flour, followed by the apple purée, the fried eating apples and 125ml ofwater, mixing with a spoon to form a rough dough. Knead the dough on a floured surface until it becomes smooth and silky. You may need more flour, or water. Just adjust as you feel fit, but err on the side of ‘too wet’ – you’ll get a softer loaf at the end. The dough needs to rise for about an hour, so that it at least doubles in size. The sugar in the dough should guarantee an impressive performance from the yeast. Knock the dough back and cut it into either two or four pieces and shape each piece into a loaf. Let the loaves prove for half an hour on an oiled tray, then glaze them with egg yolk and bake for thirty-five minutes or more in an oven pre-heated to 180c. The slightly lower than normal oven temperature helps to protect the loaves from burning, given their high sugar content and general richness. Excellent toasted, or with things like cheese or pâté. Wow – I’ve never had apple bread. It sounds absolutely delicious! 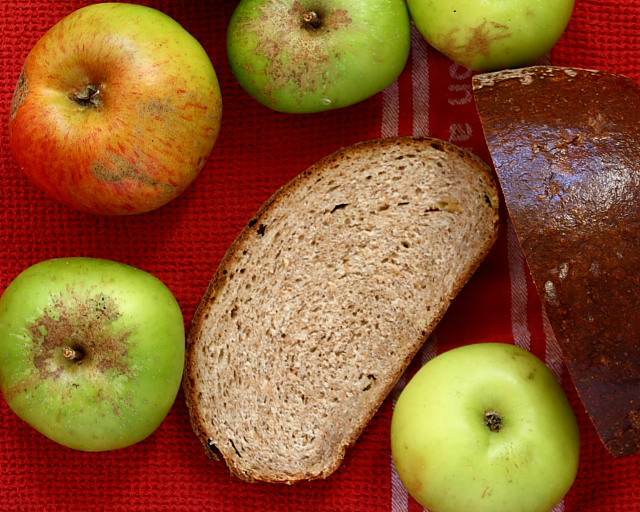 I have to say the same as Kiri – I’ve never had apple bread, but I love the ingredients list and it looks delicious! Thanks for sharing! What a great idea for using up those extra apples. The bread looks phenomenal too! Admittedly I do like baked apples, but definitely not with bramleys. I’ve never had apple bread but it does sound like one to put on my list. Can’t wait to try it for myself! Apple bread sounds amazing! I wanted a toasted piece with cinnamon sugar and butter.